This easy recipe for homemade Paleo Chocolate Chunks makes delicious dark chocolate that melts in your mouth with only three ingredients! It’s perfect to use as a Paleo-friendly or refined sugar-free alternative in any recipes calling for chocolate chips or chunks. I’m super excited to be sharing this post with you today, because it’s such an easy recipe that creates the most delicious, melt in your mouth chocolate. 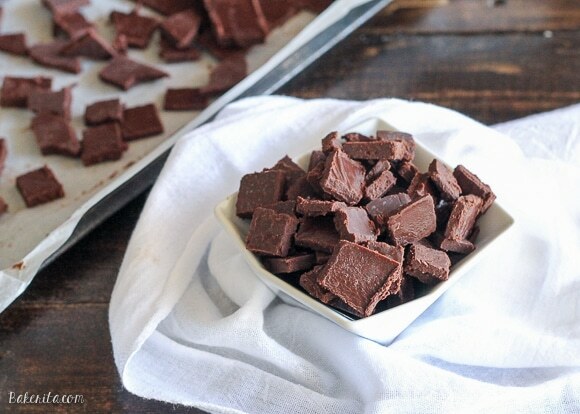 You can snack on it when you need to fix a chocolate craving, and it’s also perfect to use in place of traditional sweetened chocolate chunks for baked goods. I’ve used these paleo chocolate chunks in my Paleo Chocolate Chunk Banana Bread and my Paleo Chocolate Chunk Pumpkin Bread, and they stay melty and delicious. You could also use it in my Paleo Chocolate Chunk Cookies or Paleo Chocolate Chunk Blondies…you see, I use these chunks in a whole lot of delicious ways, and they couldn’t be easier to make. Just melt some coconut oil, add good quality cocoa or cacao powder, maple syrup, if you’d like a sprinkle of salt and/or a splash of vanilla extract, and whisk it together. Pour into a pan, let it set in the fridge, chop into chunks and use and enjoy as you’d like! I do keep these in the fridge because they do have a coconut oil base, so in a hot kitchen they’ll melt into chocolate flavored coconut oil. Now that it’s getting to be winter they’d probably survive at room temperature because my coconut oil is definitely in a solid state in my cabinet, but just to be safe, I keep these chocolate chunks in the fridge. You don’t have to guess whether your chocolate is dairy-free, or refined sugar-free, or vegan, or Paleo-friendly. You know that it is! Melt coconut oil in a saucepan over medium-low heat or in the microwave for about 30 seconds. Stir cocoa powder, maple syrup or honey, and if using, vanilla extract and salt, into the melted coconut oil until completely smooth. Pour mixture into a lined baking pan or sheet (I used a small sheet pan). Refrigerate until chilled, about 1 hour. Chop into chunks or bars. Store at cool room temperature or in the refrigerator. I have been wanting to try a recipe like this. Thanks for sharing! Rachel! You are a mind reader. I was thinking earlier today that I might email you and ask you what your favorite paleo chocolate chips are, haha. I have to develop some paleo recipes at work and have zero clue what I’m doing. I’ll have to try this for sure! Haha yay glad I could help!! :) If you ever have questions about paleo baking, shoot me an email. I’m happy to help! This is my favorite way to make chocolate! It’s so delicious and creamy and ugh so perfect! This sounds awesome and the chunks look super creamy and natural! THIS IS GENIUS! Totally going to try it! I dont use maple syrup i only use stevia or xylitol, can i still make it what would be the qty i have to use? Hi Eliana. I don’t use stevia or xylitol frequently enough to recommend an amount. I would recommend using stevia drops and tasting as you add them so you can sweeten to taste. Enjoy! Can you use Honey or the Maple Syrup? Honey or maple syrup would work! Turned out awesome, and it is simple. I have made something similar to this, but used honey. I like maple syrup a lot better. If you add a little coconut milk to this, it makes an awesome hot fudge. The hot fudge is a great suggestion! So glad you like the recipe, Amy. Thanks for commenting! 1) What brand cocoa powder you use / recommend? Hi Tina! I’ve used a bunch of different brands of cocoa powder for the recipe (I make it ALL the time) and all of them have worked. Whatever you have on hand should do the job! About the sweetness, start with one tablespoon of sweetener and go from there – it won’t affect the texture so do it to taste. Enjoy! Rachel can we use any other oil or butter? I haven’t tried it with anything other can coconut oil. You would need an oil that solidifies at a cool room temperature for this recipe to work…I can’t think of any that would do the job besides coconut oil. Sorry! I can’t believe I didn’t think of that – cocoa butter would certainly work! Thanks, Kari. Are you asking if you can sub ghee? I wouldn’t recommend it – the flavor would be buttery, which isn’t what we’re looking for here. Can I substitute the maple or honey for coconut sugar? If so, do you know how much I would use? Hi Farrah – I wouldn’t recommend substituting coconut sugar because I don’t think it would fully dissolve, leaving your chocolate gritty. If you did want to try it, I would use an equal amounts and maybe cook the sugar in the coconut oil over low heat to try and dissolve it before mixing with the cocoa powder. Let me know if you try it and how it turns out! Update: I did try making a syrup first with coconut sugar and water and it wouldn’t fully dissolve and it did not work! I did try the recipe again using coconut nectar and it turned out amazing. If you’re looking for a lower glycemic sweetener like I was, for my diabetic family, the coconut nectar worked perfectly. I used the same amounts suggested for the maple or honey and it worked out great. This is an awesome tip!! Cannot wait to make this chocolate!!! Hi! Would the chunks not melt in baked cookies or bread since it is just basically coconut oil?? Or do the chunks stay intact? Hi Laura – they don’t stay exactly like regular chocolate chunks but they won’t entirely melt into the cookies or bread. Any suggestions to make it more like milk chocolate and still adhere to paleo standards?? Perhaps some unsweetened almond milk? I’m almost speechless at how simple and amazing this is! Super quick for my in a pinch chocolate fix needs. Thanks! So glad you like it!! Thanks for the feedback Kaley. I made your recipe but seem to have failed as the honey all sank to the bottom, when it had set – did i do something wrong? How odd – I haven’t heard of that happening before. Did you make sure the honey was fully incorporated into the mixture before pouring it? Was your honey granular at all? That’s all I can think of…I do normally make this with maple syrup. Thanks for this great recipe! It’s so easy and the ingredients are staples in my pantry. 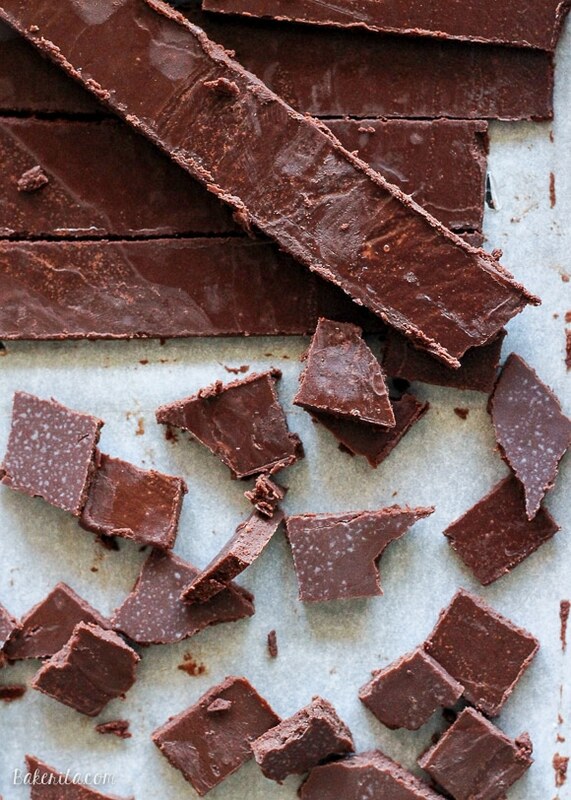 The chocolate has a slight coconut smell and definitive coconut flavor when raw. We’ll see how it bakes up, though – I may never buy chocolate chips again! I made this with raw honey and had the same issue Carol mentioned. Constant stirring of the bottom using a silicone spatula and freezing instead of refrigerating seemed to reduce separation. I then ran hot water over the bar to melt off the coconut oil that did separate. Maybe processed honey works better? I’m excited to try this with maple syrup – perhaps it will mask the coconut and hopefully it won’t separate. Thanks, again! Hi Brynn! 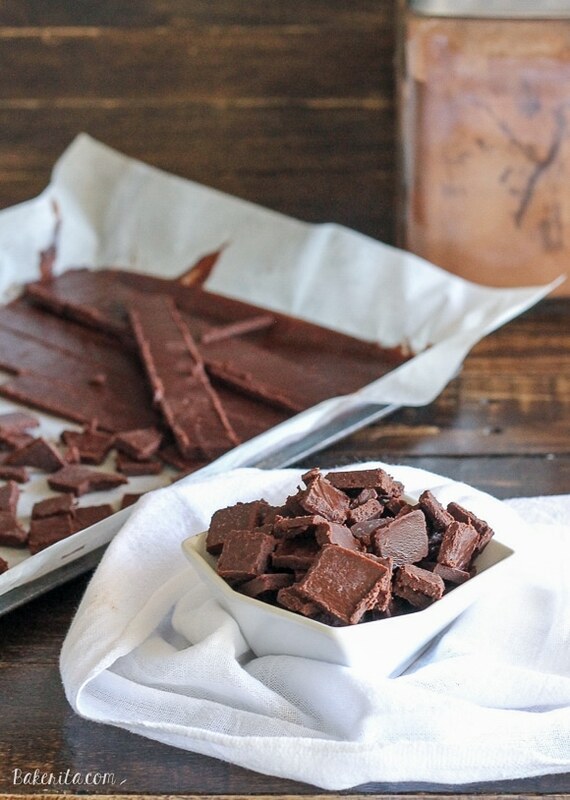 I’ve been meaning to update this recipe that I now love using cacao butter in place of the coconut oil – it’s way more stable, and tastes like CHOCOLATE instead of coconut, so I think you’d love it! Also, I do prefer maple syrup in this recipe – I find the flavor to be less noticeable than honey! To substitute cacao butter for the coconut oil, would I melt it before measuring out 3/4 cup or measure out chunks before melting……I didn’t know if that’s would make a difference or not….? Hi Christy, I usually guesstimate my measurements for cacao butter and then melt it down in a liquid measuring cup so I can get rid of any extra if I melted too much. Hope this helps, enjoy! Do you have the calories for this? Hi Jessi, I just updated the recipe with the nutritional information. I’m extremely new to Paleo diet & checking out lots of web sites I came across your Paleo Chocolate Chunk Banana Bread which looked delish, it took me to your Paleo Chocolate Chunks my question to you is How do you measure coconut oil? Hi Mary, I melt it in a liquid measuring cup and use it to measure out what I need! This recipe chocolate paleo chip recipe is easy to make and delicious! I will definitely make this again instead of buying chocolate chips. So glad you’re enjoying them. Thanks Jacqueline! These are awesome!! Just made my first batch. I love that it uses ingredients I always have in my pantry so I can make whenever I need! And it was so quick to make!! Thank you!! Is their a difference in using cacao powder vs cocoa powder? You can use either here, cacao is just a raw form of cocoa (which has been heated to high temps). I grow my own stevia….can I use stevia to sweeten instead of honey or maple syrup? Hi Mary, I’m not sure how you would process fresh stevia to be the right texture to incorporate here, especially since the maple syrup provides some bulk to the recipe. I haven’t ever used fresh stevia so unfortunately I can’t be much help here, sorry! Would this keep in the freezer if I wanted to store some for later? My thirteen years old daughter and I loved this. Thanks for the recipe! I will be making it again. I have made similar recipes with honey but really like how it turned out with maple syrup. Just mixed this together and set in refrigerator to cool. Cannot wait to test it out in a banana bread tomorrow!!! I hope you love them!! Enjoy. This chocolate is so good!!! So happy you’re loving it! Thanks for your feedback April. Thanks for letting me know, J! Hello! I was very excited to try this recipe but I don’t know what happened but mine separated and the maple syrup sank to the bottom. :( It tastes great but it’s just not solid all the way through. I did see other people had separation issues so I’ll try it again later and use the freezer instead of the fridge.. I wasn’t sure if the 3/4 cup coconut oil was supposed to be a melted measurement or solid so maybe that contributed? Hi Hima, sorry you had issues! I’ve found for separating, it helps to let it cool on the counter for about an hour, stirring every 20 minutes or so to mix everything back up, and THEN pouring into the mold/pan to finish setting in the fridge really helps (I haven’t had issues with this recipe separating personally, but it’s helped for a vegan white chocolate recipe I’m working on :)). The coconut is melted as part of the recipe, so it doesn’t matter how it starts out. Hope this helps! Would coconut nectar work in the place of maple syrup? I haven’t tried it so no guarantees, but it should be fine. Hi There… if I wanted to add a “flavor”, say Lavender… how best would I incorporate it into your recipe? Hi Josh, I’d recommend using a flavored oil (like edible essential oils) to flavor the chocolate! Thanks! With regard to this recipe, can you advise “how much” essential oil should be added? Also do you think ghee can be swapped in for coconut oil 1:1? Hi, when you say coconut oil, do you mean refined or unrefined? I never know which one is intended in paleo recipes because I think unrefined is the only one that is considered paleo, but it has the coconut flavor. Thanks. Hi Amanda, either is fine! I’ve never heard that refined coconut oil isn’t paleo, but that’s what I’d use if you’re sensitive to the coconut flavor. This recipe is amazing! I love how it turns out and how fast and easy it is to make! I have had it separate a few times so I am going to try letting it cool before I pour and refrigerate. Definitely a paleo game changer! No more $7 paleo chocolate bars for me! Home made all the way! This recipe is a life saver! A family member was diagnosed with MS last November and we were advised to switch him to a paleo diet. He would have a low calorie fudge bar every night but had to stop with his small, sweet vice because they are not paleo. 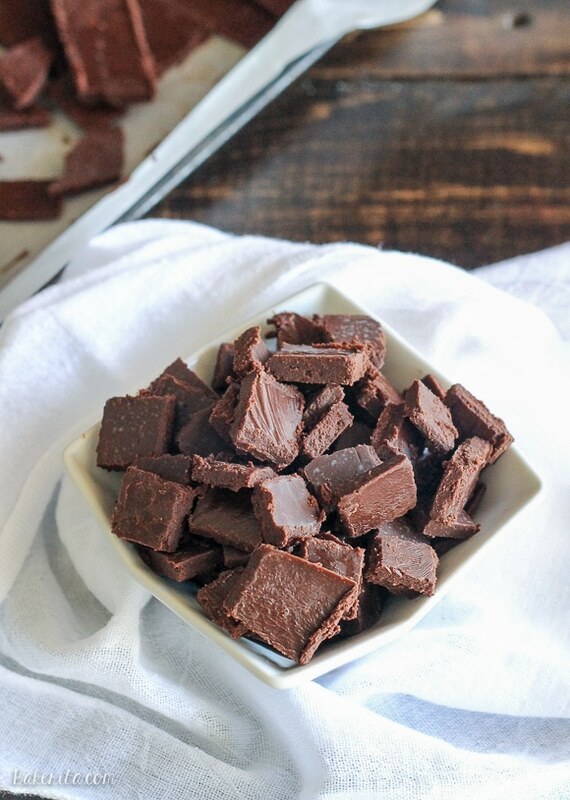 I made him a batch of this chocolate, and we both could not believe how great this chocolate really is. Thank you!! So thrilled to hear that this can be a sweet treat for your family member to enjoy, and so kind of you to make it for him! I love this recipe so much!!!! Would you recommend using it as “baking chocolate” in brownies? It does get a little melty, but if you substitute cacao butter for the coconut oil, it holds up well in baking!